Dealing with Voles Inside Your Home - Yes Pest Pros, Inc. Dealing with Voles Inside Your Home - Yes Pest Pros, Inc. The rodent family has a lot of cousins. One year-round nuisance from this family of bothersome pests is the vole. This small creature, also called the field mouse, does not hibernate and continues to do damage to lawns and plantings even through the winter. Voles are stocky little rodents with compact bodies and short tails and legs. Their eyes are also very small, and their ears are somewhat hidden. They are usually brown or grey or a combination of the two. Many different combinations of these colors can occur. It may be difficult for the average homeowner to tell the difference between an ordinary mouse and one of the 23 species of voles found in the US. A vole pest control expert will likely be needed to make the determination. 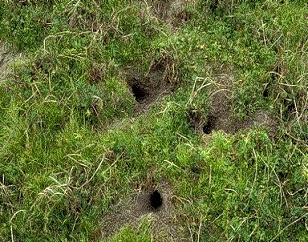 Voles do most of their damage outside. They are primarily herbivores, eating grasses, roots, rhizomes, bulbs, tubers, bark and other plant materials. They may also include the odd snail or insect as well. Their primary food source also happens to be the same stuff we humans spend so much time cultivating in our yards. Our prized lawns are a salad bar for the vole. The tender grasses and tasty bulbs make a great buffet for these rodents. A yard crossed by their underground tunnels and above-ground runways are often the first sign a homeowner has of their presence. It’s this evidence that often prompts a call to a professional pest control company. Voles may also damage young trees by girdling. Like many small animals, they gnaw around the trunks of the tree near ground level. Girdling can often kill a sapling or smaller tree. Your favorite spring flowers are also at risk when you have voles in your yard. They love to burrow under your drifts and perennial beds and eat the valuable root systems. Bulbs and rhizomes can be expensive, not to mention a fair amount of work to plant. Controlling voles is a job for a professional pest extermination company. There are a number of different methods of eradication that can be employed against voles and a pro should decide which one is best for the circumstances. Look for a South Bend pest control company willing to use environmentally responsible methods of ridding your yard of voles. Toxicants and other harsh chemical may cause more harm than good. Environmental controls and repellants may do the trick but if more caustic measures are needed, green pest control company will try to minimize the negative effects.